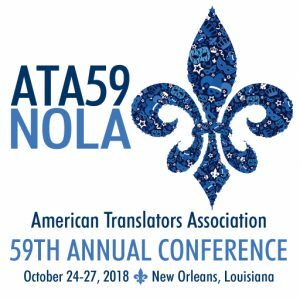 The Nordic Division held its 2018 Annual Meeting during the ATA59 Conference in New Orleans. The Annual Meeting Minutes are now available to view online, click here. Via the same link, you can also access Annual Meeting Minutes from previous years. The 8th Nordic Translation Industry Forum (NTIF) will be held on November 21-23 in Oslo, Norway. This year’s conference theme will be Multilingual Intelligence and also has a 3-hour “unconference” session especially for end-clients. The early bird price ends on October 15 (tomorrow!) and according to the organizers 90+ people, representing 50+companies from 20+ countries have already signed up. The NTIF conference, which is open also for freelancers and students, was created in 2011 as a meeting place for language industry professionals and aim to have a regional focus on its themes and speakers as well as its venues. Don’t miss the chance to take part in this year’s ND dinner at the ATA conference in New Orleans! 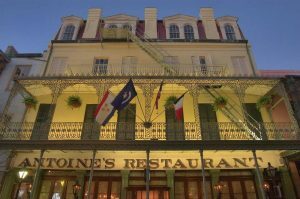 This year we will meet at the oldest French-Creole Fine Dining Restaurant in New Orleans; award-winning Antoine’s. We will have a private room and there will be some wine and appetizers on the table “to get the party started”. For the rest of the evening we will order off the menu. Dress code: Business Casual — collared shirts are required for gentlemen. Just a reminder: The early bird deadline for the ATA conference is approaching! Register by September 14 and save 30%! As previously announced, an ATA certification exam sitting will be held in Malmö, Sweden, on Friday September 14, i.e. just before the SLAM conference in the same city. The exam sitting will be computerized and is open for all ATA members working with the ATA certification language combinations. Please note that there will be a maximum capacity of 24 places. Admission is based on the order in which registrations are received. Register here by Friday, August 24, and/or spread the word to others who might be interested! We hope to see many of you in Malmö in September! Filed Under: Certification, Malmö (S), SLAM! And don’t forget: Register by September 14 and save 30%! We hope to see you October 24-27, 2018 in New Orleans! Trailing spouse turned professional translator? Gry Bruno, Norwegian student at the Houston Community College. “Forty, fat and finished” is the Norwegian take on this quote. I was indisputably past forty, I was moving to Texas so of course I was going to get fat, and worst of all, I had the clear notion of being undeniably finished. As a trailing spouse of a husband in the oil business, I had filled my 10 years in England with activities that I confidently thought would explain my absence of payed work in a rather convincing way. But this time around, I was no longer my old confident me. Midlife crisis was hitting, and it was hitting me hard. But, there I was in Texas, where they have everything I loathe, from big cars and endless highways, to armed school guards and spying housewives (also armed), and snakes and scorpions, and even black widows. With my daughters well settled into their school and daily life, I had way too much time on my hands. A post on a Facebook group for Norwegians in Houston finally grabbed my attention. The community college in Houston was offering a three-semester Level II Translation and Interpretation program, and I realized that this could be a way for me to formalize the knowledge and experience I had gained from living in an English-speaking country for 10+ years. It might even help me with a change of career! The hot and humid sky of Houston looked just a little bit brighter. The program at Houston Community College that I started is a language-neutral program, which teaches both translation and interpretation skills, within both commercial, legal, medical, and sci-tech fields. This wide approach has given me a good overview of how the different areas work, what sort of work you can expect and what sort of qualifications I would need to take on specific tasks. It has made it easier to realize where my strengths are. To no surprise, technical translations proved much more fun than legal ones, and my background in chemical engineering finally shone through. I also found that I prefer translating over interpreting, which is good, since I have not seen much need for a Norwegian interpreter so far. The courses I enjoyed the most were the basic courses, where we learned about different techniques and how to handle un-translatable words and ideas. I am quite humble about my lack of formal linguistic education in Norwegian, so I have truly enjoyed looking into the world of linguistics. It has been an eyeopener to learn about the concepts of style and tenure, register and tone, and the challenge of finding good translations for language specific collocations, idioms and proverbs. Some very interesting courses covered the ideas of transcreation and localization, and I found these concepts particularly exciting. May we guess that office assistant Jolene also likes the idea of CAT tools? One obvious challenge for me is to gain confidence in my target language, Norwegian. 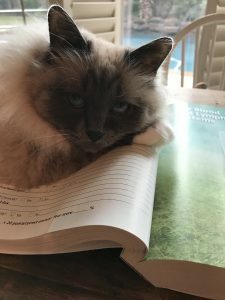 Although we all speak Norwegian at home, socialize with fellow Norwegians, and go home to our house in Norway as often as possible, I have not been writing a lot in my mother tongue lately. I have started reading both translated books and especially subtexts with greater care. Since I have always loved reading, the amount of time you spend in a car in Houston Texas has proven to be a golden opportunity for audiobooks and podcasts. I find that podcasts in particular, are a very good way to keep in touch with both the language and also news and debates back home. Another way of practising my Norwegian skills has been to translate TED talks. A wonderful way to get free feedback on your translations! My goal is to force myself to practise writing more in Norwegian, to keep on improving my skills there. I will work towards passing the Norwegian National Translator Accreditation Exam sometime soon, which would hopefully give me some formal credibility. What I have also found, are all these forums and various groups of fellow translators, and I have been impressed with how helpful and welcoming they all are. 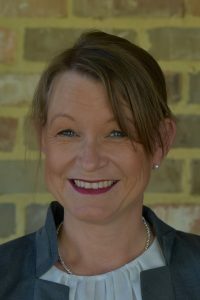 The translators I have met so far seem to be interested in maintaining high standards and a high reputation of the profession, so I am very excited about getting to know the industry and the people in it better. The program at the college has given me the confidence to get out there and try a new career, and I look forward to keeping on learning more and developing my skills further. And with that I feel confident that although I might be past forty, I might be able to find work as a freelance translator, leaving me time to go to the gym and work on that fat, and I definitely do not feel like I am finished anymore. SLAM! is returning to Malmö for another round of high-level conference sessions. Internationally acclaimed speakers from around the world will fill the historic halls of Sankt Gertrud with tales of industry best practices in specialised fields of the language industry.